Other than that admittedly minor complaint, this really wasn't so bad. Although as Totally Basmatic wisely reminded me in the context of Chori Chori, that's the kind of compliment that's the kiss of death. Here it's not quite death - if you stumble across Shaadi Se Pehle you'll quite possibly enjoy it just fine, timepass, perfeclty pleasant few hours, but don't go out of your way. 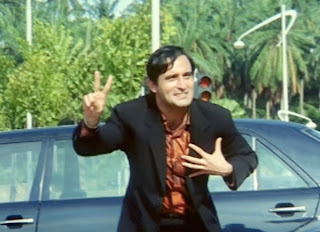 Which brings me to the real question at hand: why is someone with the talents of Akshaye Khanna making movies I shouldn't go out of my way to see? Of course my hopes are high for Salaam-E-Ishq, but his lack of compelling chemistry with Ayesha Takia has me a little daunted. They weren't awful together; more like "serviceable." Again, the kiss of death. But at least in that there will be lots of other people to rely on. You have to believe that he really loves her in Shaadi Se Pehle, loves her enough to try a Really Stupid Idea to protect her feelings. Let's voluntarily overlook the hope that when you truly love someone, you communicate with them about big life decisions. I haven't decided whether my lack of investment in their love is due to dull and limited writing - in which they try to tongue-in-cheek-Hindi-film-jokingly gloss over the development of the relationship, substituting for dialogue and character development a wink-wink joke that the apperance of a duet means that the heroine and hero are in love - or to a simple lack of "chemistry," whatever that means. She in particular is given very little to work with. In some ways this lack of emphasis on the start of their relationship makes sense, as the story is really about the set-up and effects of his shenanigans, but, as a general rule,* caring about the leads is a big chunk of what's needed to carry us through the rest of the movie. after protesting he gives it a go (sadly the scene cuts to something else right here, so we only see the start of the wiggle, and the grocery store didn't include the features disk with this rental, so my dreams of seeing it on the blooper reel are unfulfilled). 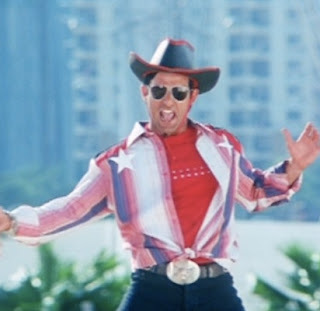 Sunil Shetty has some funny scenes, but his schtick quickly gets repetetive. It's as though he's playing Main Hoon Na's Raghavan for laughs instead of seriously. (Now there's an interesting question: how do you decide when to play an essentially funny role seriously instead of full-on jokingly?) I wonder why Anupam Kher bothered to be in this - talk about being given little to do. And I do hope Rajpal Yadav is not on his way to becoming the next Johnny Lever - he's capable of much better. and, my personal favorite, yummy. And remember: if you decide to see this, walk, don't run. And be sure you look both ways before crossing. * Exceptions apply. Some movies escape this rule by having lots of other aspects to delight or engage the viewer, like disco dancing or ninjas. SSP was so tacky, and the oufits were HORRIBLE. Also Akshaye and Ayesha pairing wasn't all that grea init, however I changed my opinon after seeing them together in the SEI promos, and this very pic below. Their pairing is cute in SEI, and Filmfare did SEI special edition covers with some of the cast members. Its hard to imagine that this gorgeous pairing was that one that we saw in Shaadi se Pehle. Ditto for hoping for goodness Akshoo/Ayesha-wise in SEI. I have hope because Ayesha did Dor, which is supposedly REALLY good performancewise, especially her. 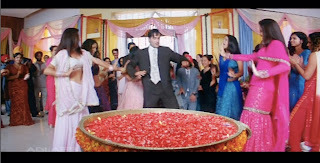 And the trailer was hilarious and Akshaye was hot. Yeeeah. I'll go now and try to lower my expectations. I'm scared of seeing SSP. 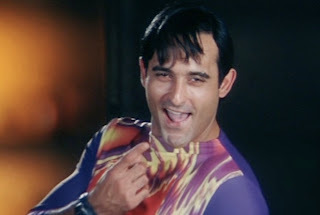 Perhaps I should see Hungama, though, it seems to be one of the better Akshaye films I've yet to see. Beth, dahling - I too have thought (in the past) that akshaye was pretty darn awesome. however, seeing him in those clothes, with that hair! has killed any such feeling. how is he *still* your FPMBF??? I can't say much about Akshaye on this blog anymore :) but what do people think of Ayesha? I've seen her sparingly and when she's on, she is terribly charming and cute as a button. But I've also seen her looking fairly ghastly. Who IS her stylist? Inquiring minds want to know. in the fake-pretend seducer shot, he looks just like Nicholas Brendon from Buffy! icy - thanks for the photos! I agree, Salaam-e-Ishq is so promising! Sanni - I've said it before, and I'll say it again - I do not understand what the big deal about Hungama is. I very much prefer Hulchul, though that is a minority opinion. In Hulchul you get Arshad Warsi as sidekick, as well as Jackie Shroff, Paresh Rawal, and Amrish Puri. Part of my "enh" about Hungama is not being able to understand the dialogue, I'm sure; I've had similar reactions to other big comedies, like Andaz Apna Apna. Sharon - understandable. Just focus on the prepped-out ones. Much better. I'll send you some from my stash if need be. Aspi - oh no, I mean no censorship here! :) You say whatever you like! I appreciate your assessment of Ayesha; I've only seen her in this, but I have faith that you're right and that Salaam-e-Ishq will be at least six (one per couple) kinds of great. Cathy - yes he does! Weird! anonymous - as soon as they make the local video store, I will! @Anon, I'll take those recommendations, thanks! 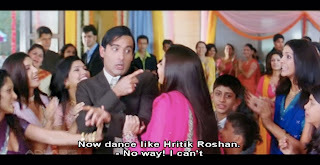 I haven't seen Dor but for some reason that little sisterhood ditty in that movie "Imaan ka asar" always makes me stop whatever I'm doing and listen *very* carefully. There is a vid on youtube which doesn't even begin to do it justice: http://www.youtube.com/watch?v=rt1SaDZHUEc. By "New York," do you mean "Illinois"? I believe the word is "geeked."